Maybe it has been the odd-for-August, oh-so-foggy June Gloom that has us in a British state of mind. Maybe it was the "Austin Powers" set pieces we spied in a story about 20th Century Props, the treasure-filled house that recently made headlines with its massive movie stuff auction. Probably it was both those things that made us mad for a story originating UK way. 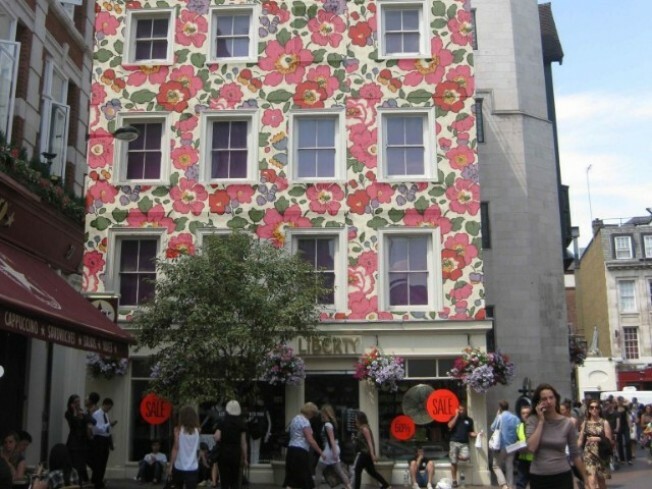 Austin did love his Carnaby Street so, so it shouldn't surprise us to see something on that London thoroughfare get all gussied up, not in Powers-friendly velvets and ruffles, but an old-school Liberty of London print. That something, we should mention, is a huge building. It's not often one sees an entire building covered in fabric. Not unless Christo and Jeanne-Claude have been in the vicinity. But Making Things spied this straight-from-the-UK story about Liberty, that venerable fashion house, and its new Prints Charming exhibition, in which is salutes a bevy on fresh fabrics from top artistic people. Polo-playing types have been fans. Sloane Rangers. Ladies who lunch. And the occasional rebel. More than occasional, probably. Is there anything cooler than carrying a Liberty tote while wearing a punky little number? To celebrate, Liberty has swathed the Carnaby side of its business with its Betsy print. Lots and lots of Betsy print, we might add. Mighty whimsical, Liberty. To take it further, Liberty is inviting fans to dress up in its prints and show for a celebration on Thursday, August 13th. So if you're in that neck of the woods, best Liberty up and make for Carnaby. We're not jealous of a giant building getting outfitted. Well, not too. Los Angeles has been the site of some major things getting covered for outlandish and promotional reasons in the past. We know how to do this. We're old hands at full-scale fabric-ing.